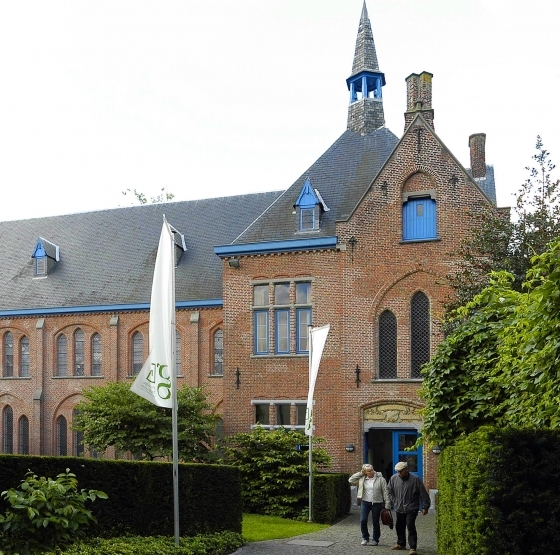 Today, the Groeninge Museum tallies some 150 works from the Southern Low Countries from the 14th, 15th and early-16th Centuries. Despite the fact that many works were made in Bruges, their place within the current collection is not a given. The dispersal of Flemish works of art during and after the French Revolution, as well as the depreciation of the old masters in the 18th and 19th Centuries have strongly influenced the early phases of the collection development. Gerard David's Judgment of Cambyses can serve as an example of this. The work is one of the top pieces of the museum. The Bruges city administration ordered it in 1498 for the decoration of the Town Hall. As a consequence of the French Revolution and the occupation of the French army in the Southern Low Countries in 1794, it was transported to Paris. Churches and pubic building were completely pillaged. In only a few months' time, the French art commissioner confiscated around 200 works from the Flemish school. In this way as well the Van Eyck's Madonna with Canon van der Paele from the St. Donaas Church--one of the current top pieces in the Groeninge's collection--, and a few works by Memling (amongst which the Moreel-Triptych) were expatriated from Bruges. In 1797, the Bruges Academy asked for permission to be able to house the works from the defunct cloisters that were not taken to Paris. The French seemed to have a preference for the works of art that were on a larger scale. One year later, in the former Duinen Abbey on the Bruges Potterierei, thus came about the Musée de l'Ecole Centrale du Département de la Lys. The first Bruges museum assembled some 500 such works from confiscated institutions, amongst which were various works that today belong to the top pieces of the Groeninge Museum. Gerard David's The Baptism of Christ (1502-1508) is just such an example. The collecting of these works in a museum and the large public important for the Flemish old masters in Paris, awakened a deep, great appreciation for painting from the Flemish school. Under the drive of the Bruges neoclassicist Joseph Odevaere, many of the paintings stolen by the French returned to Bruges in 1816. These works were brought to the Academy. The works from the Musée de l'Ecole were taken to the Town Hall in 1803. 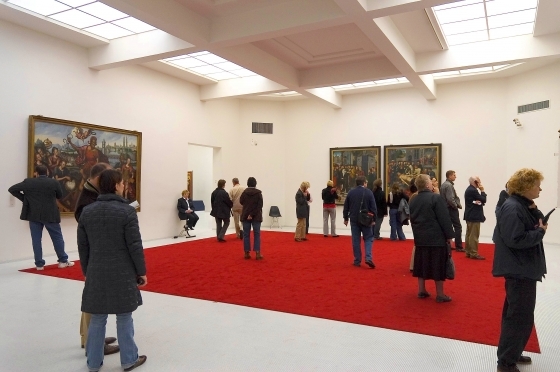 The saving of the Bruges old masterpieces was thus for the time being not centralised. Thus, Van Eyck's Madonna with Canon van der Paele, Memling's Moreel-Triptych and the side panels of Gerard David's The Baptism of Christ found a new home in the Academy. In 1824, a commission ‘for the good preservation of memorial pieces of history and art' was established. One of its tasks was the inventory of all the ‘antiquity' objects and art objects in the Bruges public buildings. Via this commission the Bruges Acadmey asked in 1828 for the transferal of the paintings to the Academy museum. Among these were found works by David, Van der Goes, Provoost and others. These paintings form the core of the current collection of Flemish primitives in the Groeninge Museum. The Academy brought the works to its museum in the Poortersloge in Bruges, until they were rehoused in 1886 to the Bogaerden school. In 1892 the administration of the Academy Museum was transfered to the city, by which the responsibilities for the painting collection fell completely on the shoulders of the city administration. The artist Eugène Copman was appointed as the first conservator of the collection. A few years later, in 1898, the entire collection of paintings was split up again. The old masters came to rest in the chapel of the Bogardenschool. The appreciation of the old Flemish masters received a boost with the important 1902 exhibition "Les Primitifs Flamands". This exhibition also contributed to the founding of the Société des Amis des Musées de Bruges, which made a case for the establishment of a good museum, inter alia. It would also still be years after the establishment of the museum friends before the Groeninge Museum opens, though the friends were still especially essential for the expansion of the collection. Whereas between 1860 and 1902 only eight new acquistions were made, that had already increased to forty-five between 1903 and 1914. The friends successfully lobbied for many gifts and legates. Thus, for example, The Crucifixion of the Master of the Strauss-Madonna came to the collection as part of a gift by the baron Houtaurt from Monceau-sur-Sambre. Bosch's The Last Judgment also was a gift, which in 1907 was encouraged by the friends. Meanwhile, already in 1842 the first catalogue of the Bruges collection was published. This Catalogue des Ouvrages de Peinture, Sculpture, Architecture, Gravure et Dessins, exposés au Musée de l' Académie, was put together by the members of the Bruges Academy. The catalogue was reprinted various times, bearing witness to a certain degree of popularity. This catalogue cannot really be called academic. It was not until 1861 before the first scholarly catalogue was published. The Englishman W. H. James Weale (1832-1917), who resided in Bruges, was the author. Weale's catalogue, Catalogue du Musée de l'Academie de Bruges, not only describes some 144 paintings, but also integrated forgotten artists of the time such as Gerard David and Jan Provoost and provided new information over Van Eyck and Memling, which Weale had discovered with specialised archival research. It was the first time in the history of the collection of the old masters that such a study on the Flemish Primitives was carried out. However, the publication of this foreigner was met with a lukewarm reception by the members of the Academy. Weale, however, perservered and annually published new information on the 15th-century masters, their works and their projects. Weale can deservedly be called the re-discoverer of the Flemish primitives. His work forms the basis of the academic character of the current collection policy of the Groeninge Museum. In 1930, not coincidentally on the ocassion of the jubilee of Belgium, the festive inauguration of the new Groeninge Museum took place. The art-deco building was designed by Joseph Viérin and would since that time house the Flemish primitives collection, among others. Many works that had previously been preserved in less desirable conditions in the Academy, could then enjoy a sufficiently museum-quality position. For this ocassion, a new catalogue was also published. It was not until 1954 before the first academically-trained director was appointed. In a short time, Aquilin Janssens de Bisthoven made sure that the Groeninge Museum could profile itself as one of the most active research instiutions in the field. Since that time, the collection continues to grow, though indeed dependent upon the offering on the art market and the fiscal feasibility. For new acquistions, the museum has control over a museological investing fund collected by the contributions of ticket sales. There is also a separate purchasing budget of the city administration. Furthermore, the museum can rely upon the generosity of the Friends of the Museum. New acquisitons always fall in among the purview of keyworks and top pieces of the Groeninge Museum and contribute to the art historical importance of the current collection. In 2008, three side panels from the Retable of St. Nicholas by the Master of the St. Lucia Legend were obtained by the Flemish Community and were given on long-term loan to the Groeninge Museum. These three panels belong alongside the central panel, already present in the collection. The addition of these three side panels provided a significant appreciation for the museum's worth. The search for the fourth and final side panel is ongoing.